Your donations support and help insure Blacklisted News's continued future and success! Blacklisted News is an independent platform for critical coverage of world news and beyond. 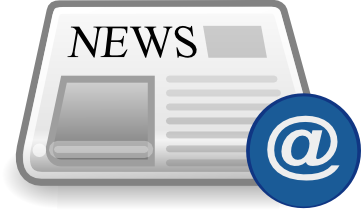 News tips, article submissions, and feedback from readers is welcomed and appreciated! Have a story you would like to publish on Blacklisted News? We don't shy away from controversy, and will publish anything that interests us and matches our focus for the site. "Click here" to vist our submissions page to get started. Whether you're a media buyer or an individual, we have simple cost-effective web banner advertising rates and packages. We deliver true targeted visitors to your web site at the lowest possible price. Your advertisment will get great exposure to the hundreds of thousands of monthly visitors to BlackListedNews.com Feel free to contact us for more details and Please put "advertising" in the subject line of email. Facebook has unpublished the page of Ecuador’s former president, Rafael Correa, the social media giant confirmed on Thursday, claiming that the popular leftist leader violated the company’s security policies. The move comes on the same day that Ecuador’s government allowed British security personnel to enter their embassy in London to arrest journalist and WikiLeaks founder Julian Assange, who has been sought by U.S. officials for years due to his role in releasing scandalous information implicating Washington in a range of crimes, including war crimes. Ecuador’s current leader, Lenin Moreno, was openly opposed to Assange, whom he referred to on various occasions as a “miserable hacker,” an “irritant,” and a “stone in the shoe” of his government. Moreno’s distancing from the asylee came following a 2017 meeting with Trump campaign confidant and political “fixer” Paul Manafort, where the two discussed Ecuador’s handover of Assange to U.K. and U.S. authorities. In March, WikiLeaks published a tranche of documents dubbed the INA Papers linking President Lenin Moreno to the INA Investment Corporation, an offshore shell company used by Moreno to procure furniture, property, and various luxury items. The account number for the offshore account allegedly used by the president to launder money was shared across Ecuadorean social networks by netizens of all political stripes, including by Correa – who had about 1.5 million followers and whose Facebook page enjoyed more interactions and attention than that of President Moreno himself. The account number was also shared alongside personal photos of President Moreno enjoying lavish breakfasts and dinners of lobster—imagery considered especially damning for the people of Ecuador given Moreno’s previous boasting of an austere poverty diet consisting of eggs and white rice. 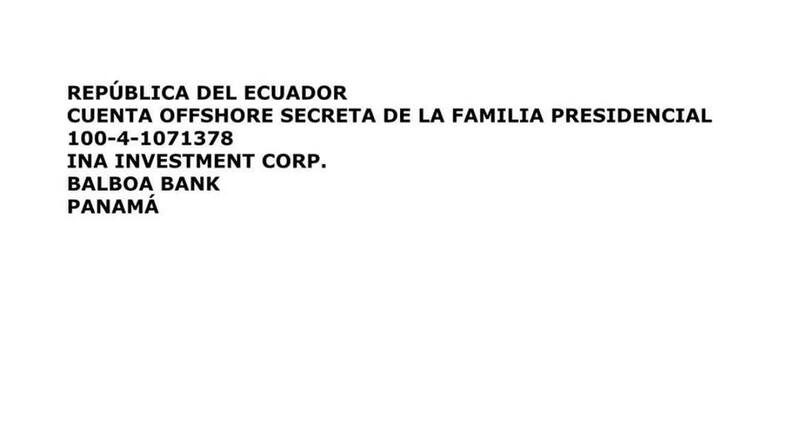 Information on the bank account allegedly used by Ecuador’s president to launder money. It also came amid attempts by the neoliberal Ecuadorean government to curry favor with financiers in Europe and the United States amid the continuing debt crisis. In March, the IMF finally bailed out Moreno’s government to the tune of $4.2 billion. Prior to the removal of the page, Correa lambasted his successor in a series of posts that still remain on Twitter at the time of this writing. Since 2015, Correa—who lives with his family in Brussels, Belgium—had used the social platform to great effect, using strongly-worded posts, video interviews, and live-streams as a platform amid the Ecuadorean media’s de facto blackout of the former leader, who remains reviled by the center-right former opposition and sections of the country’s left. The greatest traitor in Ecuadorian and Latin American history, Lenin Moreno, allowed the British police to enter our embassy in London to arrest Assange. “From now on worldwide, the scoundrel and betrayal can be summarized in two words: Lenin Moreno,” the popular former president added. 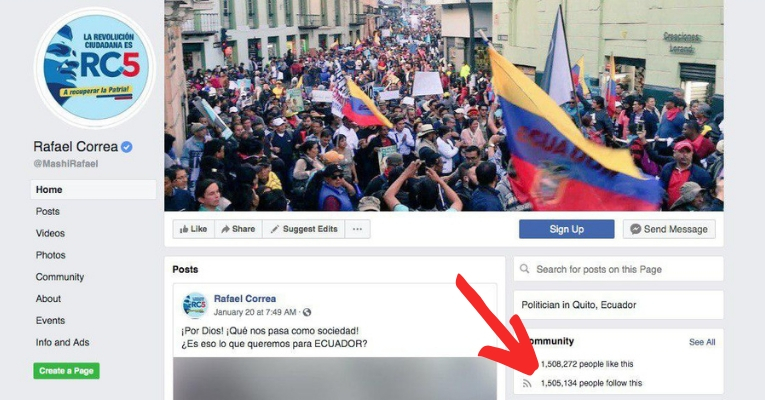 The removal of Correa’s page for violating Facebook’s “community standards” is an unprecedented move, and the former statesman is the most high-profile public political figure to ever be removed from the social platform–placing the economist and icon of Latin American “socialism of the 21st century” in the same unlikely category as right-wing conspiracy theorist and broadcaster Alex Jones. Ad Blocking software disables some of the functionality of our website, including our comments section for some browsers.